Let the sound of water falling lull you to sleep at this mountain top hide-a-way. The Treehouse sits between 2 ponds, one with bass and brim, the other with rainbow trout. Located in Western North Carolina's Transylvania County, 'The Land of the Waterfalls', 13 miles south of Brevard, NC. 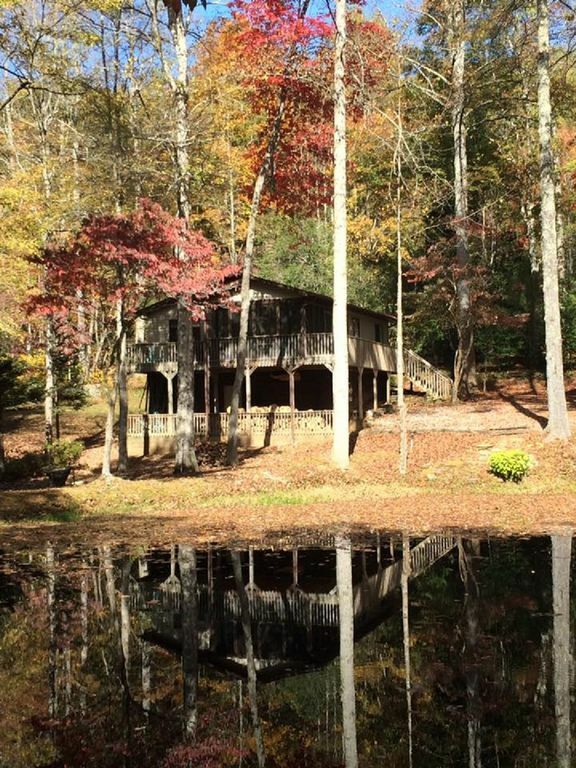 This centrally located cabin is an excellent home base to explore the many hiking trails of the Dupont State Forest and the Mountain Bridge Recreation area. The cabin is beautifully furnished and features: two bedrooms, one bath, sleeps four( one queen and two twins), central air conditioning/heat, wi-fi/internet connection, fireplace, eat-in fully-equipped kitchen with dishwasher, living room, laundry room with washer and dryer. Screened porch and open deck overlooking two ponds. Just bring your personal items and food. WiFi password can be found in the information book when you arrive. Dining seating for 8 total: 4 in Kitchen, and 4 on Screened Porch. New 49" SmartTV with Netflix, Hulu, Roku, Firestick, etc. Wheelchair ramp for cabin access built in 2016. It was rainy during our weekend at the treehouse with flooding on nearby roads but we stayed dry and warm. The fireplaces was especially nice to warm us up. Kitchen was well equipped and everything mentioned was provided. Trails were moss covered, beautiful but a bit slippery. It felt private even with other homes within sight. It did have a bit of an unused feel but I suppose the rainy weather would keep people away. Glad you enjoyed your stay. Looking forward to having you again! The perfect location in between multiple state parks & forests. Extremely well equipped. The property was, in a word, charming. Serene setting with nature chirping here and there. Clean and remote, good for privacy. Great trails! Transylvania County is the "Land of the Waterfalls", we have 250 waterfalls with many hiking and biking trails. When you tire of walking our nature trail, watching the fish, birds, occasional deer and wild turkeys, and listening to the sounds of water you are only, * 5 minutes to DuPont State Forest, * 10 minutes to Symmes Chapel (Pretty Place) * 10 minutes to Sherwood Forest Golf Course, * 15 minutes to Caesars Head State Park, * 20 minutes to Brevard, * 30 minutes to Hendersonville, * 45 minutes to Asheville Airport. The following destinations are less than an hour away, * Biltmore Estate, * Carl Sandburg Home, * Flat Rock Theater, * Pisgah National Forest, * Bat Cave, * Sliding Rock, * Brevard Music Center, *Brevard College, * Holmes State Park, * Blue Ridge Parkway, * Numerous golf courses, * Numerous hiking trails, * Many waterfalls.